As agreed by China and the European side and at the invitation of Prime Minister Andrej Plenković of Croatia, from April 8 to 12, Premier Li Keqiang of the State Council will travel to Brussels, Belgium for the 21st China-EU Leaders' Meeting and to Croatia for an official visit and the 8th China-CEEC Summit. Q: Do you have more details on the visit of President Varela of Panama to China? It's, as far as I know, the third time he visited China since the establishment of diplomatic ties between China and Panama. A: From March 31 to April 2, President Juan Carlos Varela of Panama visited Guangdong Province, where he attended an investment and tourism promotion event for Panama and met with Li Xi, member of the Political Bureau of the CPC Central Committee and Secretary of the CPC Guangdong Provincial Committee. More information about this meeting can be found in the press readout released by the Chinese side. As far as I know, Hong Kong will be the next stop of President Varela's visit. Q: Taiwan earlier said that its planes warned off the mainland's military aircraft that crossed the "middle line" in the Taiwan Strait last weekend, and that the move from Beijing was a provocation. US National Security Adviser John Bolton wrote on his Twitter yesterday that "the Chinese military provocations won't win any hearts or minds in Taiwan, and the Taiwan Relations Act and our commitment are clear." I'm wondering if you have any comment? 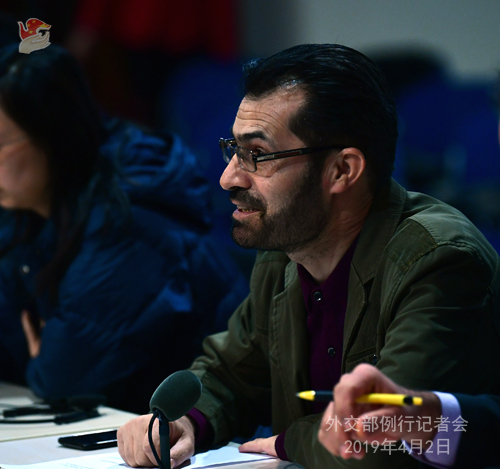 A: I'd refer you to the competent authorities if you'd like to know more about the PLA fighter jets flying past the "middle line" of the Taiwan Strait. The Taiwan leader made comments and tweeted about this. Her ridiculous words are pure nonsense and indeed infuriating. But since this is not a diplomatic matter, I believe the spokesperson of the Taiwan Affairs Office of the State Council is better suited to answering your question. However, in response to the US comments, I must say a few words. China's position on the Taiwan question has been consistent and clear-cut. The so-called Taiwan Relations Act unilaterally rolled out by the US runs counter to the basic norms governing international relations and the three China-US joint communiques. China has been firmly against it from the start. 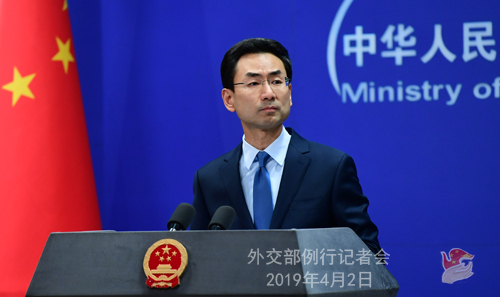 We urge the relevant individuals in the US to earnestly abide by the one-China principle and the provisions of the three China-US joint communiques, and make efforts to advance our bilateral relations and cross-strait peace and stability instead of doing the opposite. Q: The ROK President Moon Jae-in said yesterday that in his upcoming visit to the US, he will work for an early resumption of dialogue and hopes to see further progress in the peace process on the Korean Peninsula. US Secretary of State Mike Pompeo said on the same day that he hopes the DPRK and US leaders can meet again in the coming months to achieve a substantive step toward denuclearization. What's your comment on the latest development of the situation on the Peninsula? A: We welcome the positive signals sent by the ROK and the US in their remarks and commend the ROK's efforts to advance dialogue and the settlement of the Peninsula issue. In fact, after the Hanoi summit, both the DPRK and the US have expressed their willingness to maintain dialogue. 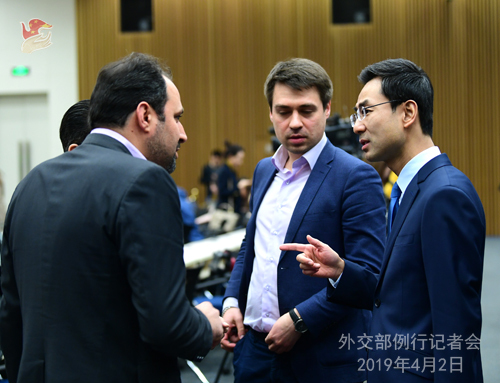 China believes dialogue and consultation holds the key to the Peninsula issue, while steady and sustained progress can only be achieved by parties that meet each other halfway. We firmly support all efforts and actions that are conducive to the de-escalation of tensions and political settlement. We hope all relevant parties can cherish and uphold the hard-won momentum for dialogue, continue to show sincerity and goodwill to each other and foster mutual trust. They need to set reasonable expectations, take phased and synchronized steps with a package plan, and ensure the sustainable and irreversible process of denuclearization and political settlement on the Peninsula. As a close neighbor, China will continue to make efforts and contributions to this end. Q: Can we please get an update on Vice Premier Liu He's visit to the US for the trade talks? A: I have nothing to update you at the moment. Q: Several provinces of Iran have been hit by devastating floods in recent days, which caused dozens of casualties and lots of damage. Do you have any comment on this? A: Regarding the casualties and property damage caused by floods that recently swamped many places in Iran, we'd like to express our condolences to the victims and sympathy to the Iranian government and people. At 10am tomorrow, the Foreign Ministry will hold a press briefing on Premier Li Keqiang's upcoming visit in the MFA Press Hall (Lanting, South Building). We look forward to your attendance.